For various reasons, I'm not allowed to look at unsolicited card designs. As such, judging the third trial in the Great Designer Search 3 (GDS3), the design test, was a rare chance for me to see the designs of amateur Magic designers. (The only other times being previous GDS iterations and "You Make the Card" events.) Today's column covers my thoughts upon seeing all the cards. Before I begin, a few caveats. One, the candidates were restricted a bit in their card designs. All of them were two-colored cards, only evergreen and deciduous mechanics were allowed, and we asked candidates to aim for an unspecified Standard-legal set. Two, I'm avoiding talking about the designs of the Top 8, as the Great Designer Search 3 already showed those. Three, when I did my pass on the 94 design tests, I ended up pulling out nineteen as my favorites. Eight of those, based on the other trials and consultation with all the judges, made it as finalists. The eleven designs I'm showing off today are from all the designers who came close but didn't quite make the final cut (in no particular order of relevance). You may cast Farsight Counsel from outside the game. One of the things that I look for in new designers is the willingness to embrace the unknown. As frequent readers know, I don't believe in doing something different just for the sake of it being different, but I do like seeing a design stretch that we can put in our back pocket for the day when it's the solution to the problem at hand. One of the things I tend to do in exploratory and early vision design is push my designers to explore virgin design space. What could we do that fits the current set's themes that would allow us to stretch the boundaries of Magic? What would surprise players if they saw it in a booster pack? A deck can have any number of cards named CARDNAME. Create a 1/1 white Bird creature token with flying, then create a 1/1 white Bird creature token with flying for each card named CARDNAME in your graveyard. One of the joys of reviewing the cards was watching the designers mix and match design elements from throughout the history of Magic. While old keyword mechanics were off limits, Magic is filled with lots of unnamed design elements. For instance, Flock of Seagulls takes the mechanic first seen on the card Kindle in Tempest and combines it with the "relentless" ability first seen on Plague Rats in Limited Edition (Alpha); the ability is nicknamed after Relentless Rats, the second card to use it. The result is a repeatable "creature" that grows in volume rather than size. Having designed Magic cards for almost 23 years (and two years unofficially before that), I'm always happy when I see combinations of things I know combined in ways I haven't seen before. It gives me hope that we have many years of elegant Magic design ahead of us. At the beginning of your end step, discard your hand, then put two addiction counters on Gambling Problem. At the beginning of your upkeep, draw X cards and lose X life, where X is the number of addiction counters on Gambling Problem. It's very easy when you start designing to get caught up in the mechanical side of design and keep making cards that mess around in a more functional space. I was very happy to see a lot of designs that worked hard to connect the mechanics to a resonant flavor. Note that this isn't just about making Vorthoses happy. When your spell's mechanics link up to flavor, it makes the card overall easier to understand and process. Gambling Problem is such a fun design to me because it lures the player in with the promise of something cool and powerful, but makes the player flirt with danger. This card could win you the game or be the reason you lose. The flavor is spot on. A quick note: these cards were chosen because they show promise, not necessarily because their current incarnation is necessarily the right mix (for example, I'd probably drop it from two addiction counters to one for a slightly slower dip into madness), but because they created something that with further massaging could be made really special. Target creature you control fights target creature an opponent controls. Then if your creature does not have lethal damage marked on it, you may repeat this process targeting the same creature you control and a creature you have not already targeted with Bunch of Punches. Bunch of Punches is a very cool card. Can we actually do it? Maybe. It's very easy to just use words like "lethal damage" and assume things will work out, but this is why the designers work so closely with the rules manager and the editing team. There are lots of cards that sound like they should work just fine that get more problematic when you're actually figuring out the words. Note that it's not just about do the words exist, but would players be happy if those were the words they had to look at. I talked above about how many designers pushed the envelope. One result of this bold exploration is that they created a number of cards that couldn't exist, at least not in the form that I think they wanted it to. I should note that I don't expect my designers to know all of this information, but I do expect them to interact with the members of R&D who do. Also, it's usually our habit to have designers write in simple English to convey content and playtest with the cards first before seeking outside assistance. If the card isn't fun to play, we won't have to waste anyone else's time. Each player discards his or her hand and exiles the top seven cards of his or her library. Until the end of your next turn, cards exiled this way may be played by their owner. A lot of people online have asked what impact the Great Designer Search 3 design tests will have on future Magic. Some cards might come from it, but even more important to me is seeing neat ways to shift things into new colors. Change the text of each Aura attached to CARDNAME by replacing all instances of "Enchanted creature gets" with "Each creature you control gets" and all instances of "Enchanted creature has" with "Each creature you control has." I don't know how many times I've designed a card similar to Aura Hacker. A lot. I've never actually managed to get it all the way through to print. Seeing Matt design this card made me see that I'm not alone in wanting it. One of the interesting things about looking at so many outside designs is watching you all do things on the outside that we're doing on the inside. For example, there were a handful of cards submitted that were already in card files, and others that were pretty close. I know parallel design is a thing. It happens all the time on design teams where two people turn in the exact same card for a homework submission. It was cool seeing it pop up here because it said to me that where we're aiming the game isn't so far from where many of you want to see it go. Search your library for an artifact card, a creature card, an enchantment card, an instant card, a land card, a planeswalker card, and a sorcery card. Target opponent separates those cards into two piles. Put one pile into your hand and the other into your graveyard. Fictitious Tutor is a very fun design. I think a lot of players would adore it. The Organized Play people would be less happy with this card, though, especially if we costed it for high-end tournament play. Tutoring for one card can be time consuming. Tutoring for seven cards? Even more so. But wait, we aren't done yet. After you spend numerous minutes picking seven different unique cards, your opponent then has to play Fact or Fiction with it. And then you have to pick a pile. This was another trend I noticed. Designers made cards that were adorable to read, but didn't always think through the ramifications the card would have on various aspects of gameplay. That isn't a luxury we have behind the scenes. As with the rules/templating, we first playtest the card to see if we like it, but early in the process we have to make sure we're not causing a major headache for someone else down the line. Sacrifice Beyond the Clouds: Exile enchanted creature, then return that card to the battlefield under its owner's control. I told the designers that they weren't allowed to use old mechanics, just evergreen and deciduous ones. Well, they went to town on the deciduous ones. Hybrid, split cards, double-faced cards, even Vehicles (they weren't even asked to design artifacts) all showed up in spades. My best guess was this was a side effect of designers wanting to push boundaries and show off within the constraints we gave them. My big takeaway was how much care they took in using the deciduous mechanics. Let's take hybrid as an example. There was a lot of hybrid, but not "boring, we've seen it 20 times before" effects; they made cool new stuff. For example, Beyond the Clouds is a neat design and could have worked just fine in mono-white or mono-blue, but the fact that it works so sweetly as a hybrid design is impressive. +1: Create two 1/2 green Spider tokens with reach. -2: Sacrifice a creature. If you do, destroy target creature. -5: Sacrifice eight creatures. If you do, your life total becomes equal to your starting life total and each opponent's life total becomes 1. One of the requests of the design test was to make the candidates design two planeswalkers. (A quick aside: planeswalker designs are very, very hard to do; they go through more changes than any other card type, by a lot.) 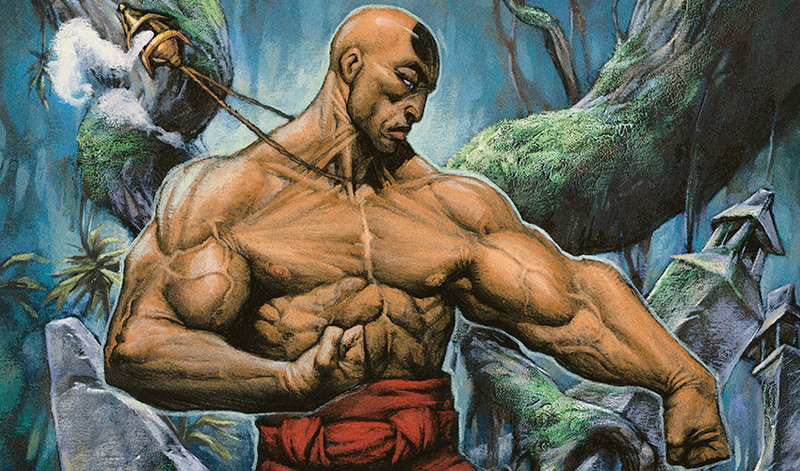 Designers took one of two paths: they made planeswalkers for existing characters or they made up their own. 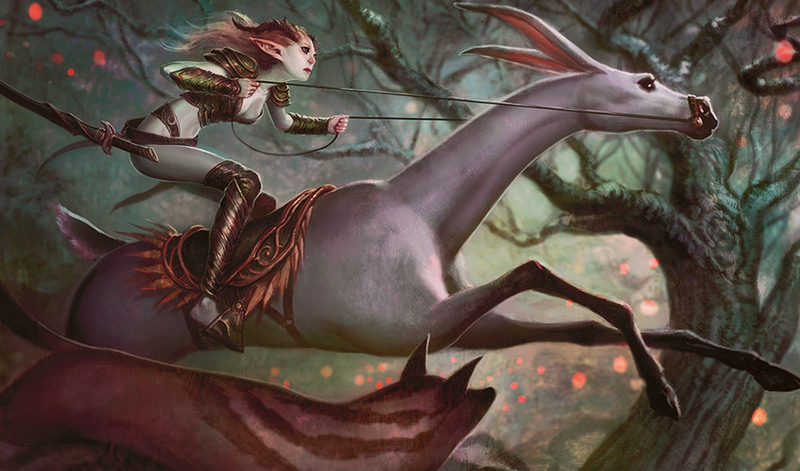 There were a lot of cool ideas for new Planeswalkers (which is something we know behind the scenes—we've been doing a lot of work to come up with exciting new stuff as well). I chose Arachne, Swarm Ritualist because I loved the story the design told. It's a creepy spider planeswalker that overruns your opponent with a swarm of Spiders. I like it. This creativity didn't stop with just planeswalkers. There were a lot of legendary creatures made, as well as numerous other flavorful designs. I got the sense that many of these 94 designers would also be interested in working on the creative team. Each creature you control gets +1/+1 for each card in your graveyard that has the same name as that creature. At the beginning of your end step, you may sacrifice a creature. If you do, search your library for a creature card with the same name and put it onto the battlefield. Then shuffle your library. "The Emperor is dead. Long live the Emperor." Another thing I was very impressed by was how often designers found ways to use elements of the game that you don't normally think of as being mechanically relevant. Take Lineage and Succession as an example. This card uses the four-card limit as one of its mechanical constraints. Creatures can only get so big because you only get to have so many copies of them in your deck. When and how you sacrifice creatures starts mattering based on how you built your deck, what cards are in your hand, and other things that you don't always think about when playing a card. Judging the design test took longer than I had anticipated because many of the designs made me sit and think about them. That's a sign of some strong design skills. And it's a sign that even after 25 years, there are lots of mechanical nooks and crannies we've yet to explore. Choose graveyard, hand, or battlefield three times. If you choose hand, each player reveals his or her hand. Each player puts a permanent or permanent card from the first chosen zone into the second, then puts a permanent or permanent card from the second into the third. If I had to pick one theme that came up the most, it would be choice. Whether it was modal spells or split cards or conditional effects that changed based on how you used them, the design tests were filled with designs that gave the player a lot of options. Take Churn the Lifecycle, for instance. This card can do a lot. In fact, it's kind of daunting how many different ways you could use this card. As I've said above, it was clear that the designers were trying to show off, and I was tickled seeing all the cool and exciting things they designed. I would just caution that if any of them made it onto my team, they'd need to make sure to tone it down a little. Choice in Magic is great when it's the icing on the cake and not the cake itself. One of the hardest things about doing a Great Designer Search is narrowing down the field. Logistics only allow us eight slots, so that means we have to make some pretty deep cuts. But 7,056 people expressed interest in GDS3; 3,056 turned in 3,000 words' worth of essays and took the multiple-choice test. Only 94 advanced from the multiple-choice test to the design test. And then, we had to cut down to eight. It was hard. I want to take a moment to thank everyone who participated in the trials for GDS3. I am honored that so many people are interested in doing what I do. I enjoy all the discussion about GDS3 on social media (yes, even the endless debates about "that question") and hope you all watch and enjoy the "show." Hopefully today's article shows that you all didn't make it easy. As always, I'm eager for your feedback, whether it be on today's article, the card ideas I showed, or the GDS3 itself. You can email me or contact me through any of my social media accounts (Twitter, Tumblr, Google+, and Instagram). Join me next week for this year's installment of "Nuts & Bolts" (my series dedicated to players wanting to design their own cards). Until then, may these lessons improve whatever you're designing.